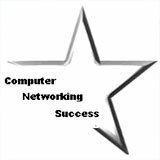 Perfect Entry-level certification to start your successful IT career! The CompTIA A+ certification demonstrates competency as a computer technician. In 2010, the certification changed from being a lifetime certification to a certification that expires every three years. The A+ certification is intended for IT professionals who have the equivalent of 500 hours of hands on experience. To earn an A+ certification you need to pass two exams: CompTIA A+ Essentials, exam 220-701 and a Practical Application, exam 220-702. The exams are composed of multiple choice questions and are computer based. 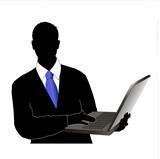 I believe this certification is extremely important in starting your career in IT. It is an entry-level certification that is part of the certification track for companies like Microsoft, Cisco and HP. 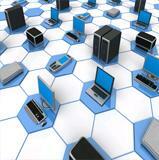 Companies like Dell, Ricoh and Intel have made this certification mandatory for their service technicians. Expect any employer to recognize this certification on your resume. This certification is well worth it! I remember when I first started my IT career and I was uncertain of what to do next. 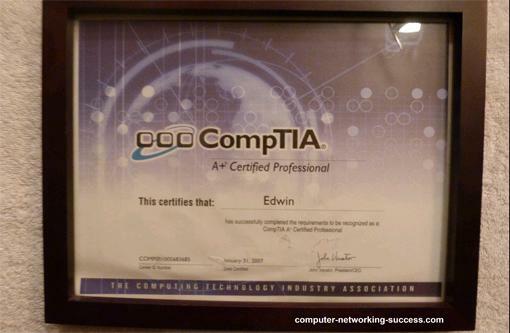 I first learned about IT certifications after I started college and I studied hard for my A+. Since I was new to the IT world, everything seemed overwhelming. I just told myself to stick with it and build my career brick by brick. 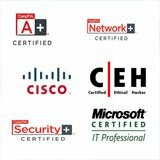 One certification at a time and not rush through it. The satisfaction of accomplishment meant so much more to me than the sleepless nights of studying. I knew the hard work was well worth! You can earn a job role without a college degree with this certification which includes computer technician, technical support specialist, field service technician at companies like Best Buy, Staples, and Ricoh etc. I strongly recommend that you pursue a college degree because that would ensure greater success in your career as you move from computer technician to more advance roles like computer network technician, computer network administrator and computer network engineer. 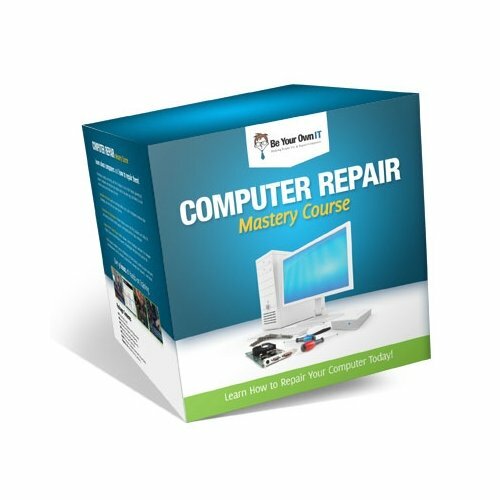 By earning this certification you can confidently start a clientele around your neighborhood repairing computer hardware and software issues. This will allow you to earn extra money which can be used to pay for college and other expenses. 2.) Use e-courses to learn the material fully! Examples are: TestOut, CBT Nuggets and Transcender.FREE Transcender demos! 2.) Use e-courses to learn the material fully! Examples are: TestOut, CBT Nuggets and . 4.) Study some practice questions. Guarantee yourself that you will pass the exams by using Transcender. Pass the exam with Transcender. Guaranteed. Order today! Set a date and schedule it, this way you will be motivated to study knowing you have a set date. 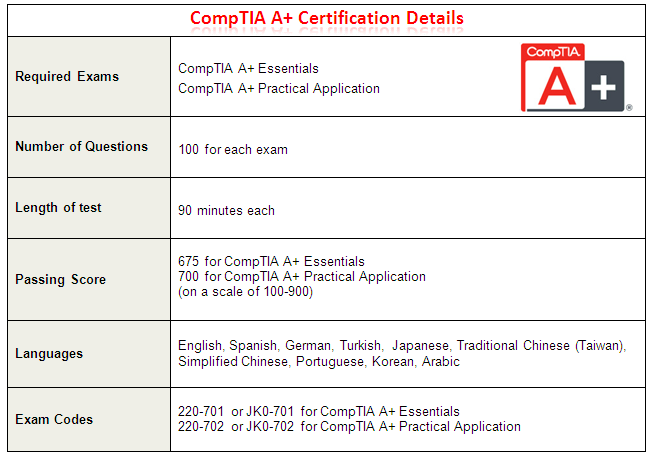 In order to earn the CompTIA A+ certification a candidate must pass two exams. The first exam is A+ essentials, exam number 220-701. You must have the knowledge required to understand the fundamentals of computer technology, networking and security. You must understand the basic functionality of the operating system and basic troubleshooting methodology, practice proper safety procedures, and effectively interact with customers and peers. The second exam is A+ Practical Application: Exam Number 220-702. You must have the skills required to install, configure, upgrade, and maintain PC workstations, the Windows OS and Small office Home Office networks. You should ideally have already passed the A+ Essentials exam. Given a scenario, install, configure and maintain personal computer and laptop components like HDD, motherboards, memory and adapter cards. Given a scenario, detect problems, troubleshoot and repair/replace personal computer or laptop components. Troubleshoot client-side connectivity issues using appropriate tools like: TCP/IP settings, network protocols and firewall settings. Implement security and troubleshoot common issues like: NTFS vs. share permissions, encryption, BIOS security and user authentication. Tell Us About Your Home Practice Lab for the A+! It's easy to do, Just use the following form to submit your own page describing your home practice lab that you use to practice your CompTIA certifications. Also provide tips on how to earn the A+ certification.